Greetings! We have some forward progress. Yesterday we practiced hooking up the truck to the RV. We still haven't put the four wheel drive transfer case into neutral yet. We're working up to that. Here is Jim hooking the Blue Ox to the truck. Now Jim is in the basement looking for the data plate on the inverter. We have to provide the serial number to our extended warranty company. Other than that, maties, I have zippity doo-dah all to report. A yucca blooming in the park. They're prolific bloomers. It's too hot to put the laptop in my lap today. I have nothing intelligent to say, as it is. So, two pictures for you! Today is Saturday. We are still here. It's interesting (to me, anyway), how the things that I enjoy upon our return here in the fall, are now driving me crazy. In particular is the call of the mourning dove. The call that is so picturesque and quintessentially Tucson now sounds like maniacal birds from hell. Everything is starting to annoy me. It really is time to go. Next year I think we're going to leave earlier in April and go to San Diego. Look at this cactus. It's in front of one of the park models, whose owners have left for the summer They never get to see this. It's an amazing bloom. There are many gas powered bicycles in Tucson. They're all home-built. This is the first time we have seen this configuration, usually the engine is on the down tube. Changing that flat is going to be a chore. Thursday we went downtown into the historic Barrio to walk, because sitting is the new smoking. We're making a conscious effort to spend more time on our feet. It was a nice walk, not too hot. These are the original houses in Tucson. Some have been restored and are really beautiful. I love that turquoise fence. A very pleasant courtyard. See the white house on the right. It's been enlarged into another lot behind it, and it is just enormous. In the mid 1960s, 80 acres of the barrio was bull dozed to build the Tucson Convention center and parking. People were living in those destroyed houses, and had been since the 1800s. However, they were considered a blight, and had to go. This is a pretty good article on the subject. This is what happens if these buildings are not maintained. They crumble. There are several buildings that look like they're beyond repair among the beautiful restorations. According to this piece, the biggest threat to the historic buildings is the leaking water mains in the barrio. Homes were built up to the street to make room for court yards and back yards. The leaking mains are directly under these buildings, saturating their foundations. So, it's always something for everyone. This is a manipulated image, it's upside down so you can read it. Yesterday we had sky writers. Unlike the pilots of old, whose planes traced the letters using aerobatic moves, this was written using 5 planes. They would fly side by side, and release smoke at the same time; like an airborne dot matrix printer. It was a windy day - by the time they finished ".com" the rest of the website name was gone. 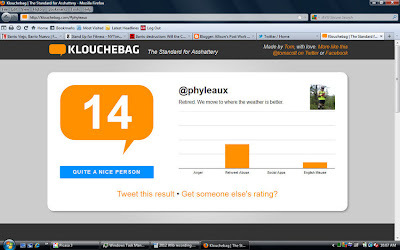 In other news, I just found this tweet rating page on the web. 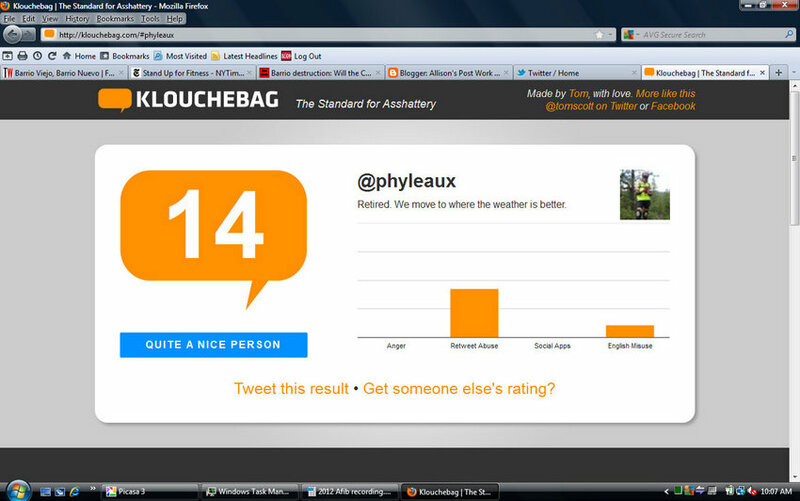 I am quite a nice person, it seems. I have no progress to report on the RV. We're really hoping to be gone this week, but the universe has not shared its plans for us yet. Apparently we are not the only denizens of the RV park with electrical issues. I took this picture Monday morning. This was a golf cart that burned to the ground. Even the steering wheel is gone. Walking back to the RV, I noticed a cholla (type unknown) that is blooming. I need to go back and see if any more of the buds have opened. Look at the thorns, that is a vicious plant. Ah yes, the electrical problems to which I alluded in my opening statement. Ken got the parts installed yesterday for the awning. It was a struggle. Apparently Carefree of Colorado was implicated in attempting to steal another manufacturer's design for a wind sensor using an anemometer. Due to their perfidy and malfeasance, they are now forced to use a motion sensor mounted out at the end of the awning support arm. It's a stupid design, just stupid. And, it does not work. More parts are being over-nighted to us to attempt to fix this. The awning goes in and out flawlessly, but it does not retract automatically if the wind comes up. So, there will be more work to rectify this issue. While Ken was here, he discovered why we are so hot. Neither one of our air conditioning units was installed correctly. The cold air return is supposed to take air from the inside of the coach and run it in to the air conditioner. What is happening is that we're pulling air from the plenum that runs along the length of the roof, that would be extremely hot air being fed to the AC units. Additionally, the front one is dying, it's venting coolant into the duct and will stop working soon. So it must be replaced. But wait! There's more! The inverter is dying. It's not charging the batteries the way it should. After Ken put it on the battery equalization setting for awhile, badness happened and it blew a fuse in the 12 volt system, knocking out the air conditioners. Aaaarrrrrrrrgh. It's always something. It's very aggravating. I get that things wear out and have to be replaced. The RV is 6 years old, we have no idea how it was cared for or anything, but the AC installation is just shameful. Monaco Beavers have a really good reputation for a quality build, which is one of the reasons we bought it. This should not have passed QC. We went out to see The Thing. It's between Benson and Wilcox. There are bill boards announcing its presence for miles. I can only imagine a poor beleaguered parent being pestered by the kids wanting to stop and see it for a seeming eternity. It's not all that expensive. However, we did not pay the buck to go see it, because we did not want to leave the RV out in the sun getting hot. Maybe next time. We saw this on the way out. There is a pickup truck on its side, that had been towing a travel trailer. The tanker truck is also in the median. Same accident on the way back. This was the second accident we saw today on I10. One always wonders how did this happen? It's a clear day, no wind - what caused these people to depart the freeway with such disastrous consequences? At this point, we have stopped making plans. Apparently the universe will decide when we're leaving Tucson, and we have little or no say in the matter. Resistance is futile. The unknown cholla continues to bloom, but I just can not get an inspiring photo of it. Too many spent buds mar the effect, so we continue with close ups that are sub optimal. I was able to generate shallow depth of field by using my 45-200 mm lens, so that part was good. This is a South West 737 on three mile final. I like their new livery much better than the old. Our campsite. I love that term, campsite. As if anyone here is actually camping. What we're doing is driving condos down the road. The dome sitting on the picnic table is our satellite antenna. If the universe ever decides to allow us to depart Tucson, we're going to Temecula to have a new one put on the roof. It will be nice to not have to bring it out and deal with coax and power cords and etc. It makes setting up camp (hah!) that much quicker. Pigeons have become the bane of RV life. They like to get under the slide toppers (see directly to the right of Jim's shoulder) and build nests and poop. So far we have curtailed any nest building, but as soon as they see us leave, they're right back under there, with all of their bodily functions. Ina in Alaska has a good post up today about what things look like in Anchorage. It was very enjoyable reading. They are happy because the snow is melting. I would be, too. They had an arduous winter. Other than what we are viewing at the moment, there is not much to report. We are still held for parts (awning motion sensor, new air conditioner, new inverter) so we'll be playing this venue for a little while longer. It's often said, and bears repeating, if you're going to own a Class A you must have a check book, a good extended warranty and a sense of humor. Greetings! We're experiencing near record heat in the Old Pueblo. The past two days have been odd, in that it has been cloudy and the humidity is up. This is a pre-monsoon sky. There's not enough moisture in the air to actually rain, but there are clouds and it's slightly oppressive. This is driving down A mountain after being at the top. Our original plan had been to leave Wednesday because we're hot. Unfortunately, last Friday we had the awning out, and then we went to bring it in because the wind was coming up. The awning motor died. In its death throes it took out the board that controls it and the wind sensor, as well as the switch. Ken came over and looked at it, and ordered new parts from the manufacturer. They should arrive Tuesday. So, if the parts come, and fix all of the problems, we're now planning to leave Saturday for San Diego. Until the awning is fixed, we can't move the slide; until we can move the slide, we can't move the RV; until we can move the RV we can't practice hooking the pickup truck to the back of the RV and towing it. It's always something. It's HAWT! I am suffering. Wunderground says it will hit 102 on Monday. We may be going to the movies where there is mass air conditioning. This has been the week of appointments. Thus far we've seen the ear doctor and the eye doctor, had the RV fluids replaced, and tomorrow the carpet cleaners are coming. Today I had a new chain and rear cassette put on my road bike. Shifting has just been abysmal as of late. We're heading out May 1 to San Diego. We'll be there for a few days and then it's off to Temecula for a new satellite antenna. We saw this guy yesterday. He has fastened the umbrella handle to his down tube. Pretty clever! Portable shade on a bike. Other than that, there is not much to report. We dropped the RV off for fluids replacement very early this morning. After a really terrible breakfast, we went for a hike in the Tucson Mountain Park before it got too hot. Look dead center in the photo. Do you see anything? 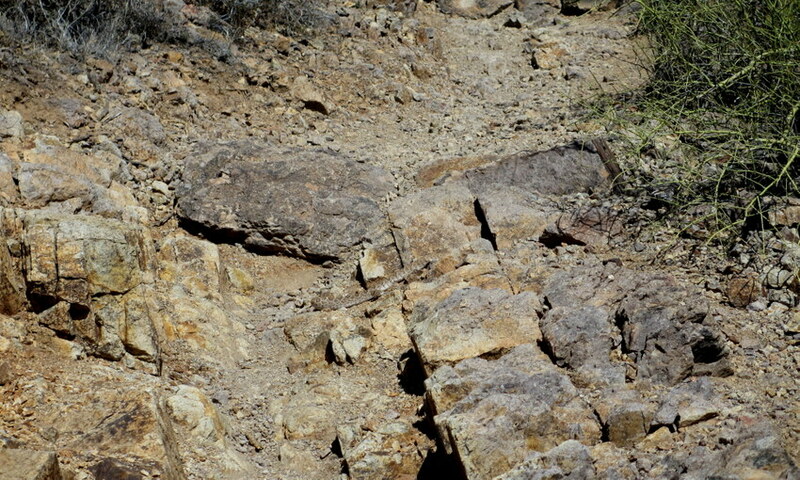 This is a rattlesnake on the trail. I came within a foot of stepping on it. It didn't rattle! It was very obliging and moved off the trail so we could continue up the hill. Fifty feet later we ran into a second snake. He was not giving ground. We capitulated and reversed course. 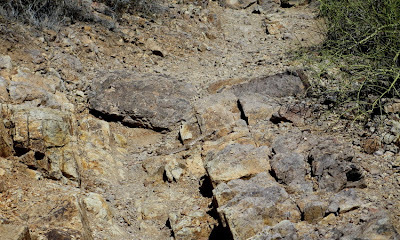 We may be done with hiking/biking in the desert. Rattlers just scare the living snot out of me! As promised, there are pictures that are not cactus today. Davis-Monthan had an airshow this weekend. Yesterday's weather was just awful, so it seemed like half of Tucson was there today, when the climate was better. It was a good show, I'm kicking myself for being so dang lazy and not taking the 200 mm lens (it's heavy), but it would have been good to have. So, note to self for next time. This is a V-22 Osprey, made by Bell and Boeing. It had a very rocky early history, there were several crashes which killed a lot of Marines. It's operational now and hasn't been in the news lately. It's a cool idea, the engines swivel, allowing vertical takeoff and then converting to horizontal flight. However, it's a very complicated implementation. This is a converted 747-400 freighter, the Air Force designation is YAL-1. It has a megawatt-class chemical oxygen iodine laser. It was primarily designed as a missile defense system to destroy tactical ballistic missiles in the boost phase. The program was cancelled in 12/2011, after spending five billion dollars on it. The plane will be kept in storage at D-M in the bone yard. D-M is an old SAC base, it's huge, big airplanes, big ramps. The Bumble Bee pedicab service was busy today. This guy was a hoot. He had a boom box blaring, and was dancing and singing. He was definitely a crowd pleaser. This is a Boeing E8 J-Stars. It's a battle management aircraft. In the first gulf war it was used to track moving vehicles on the ground for other planes to shoot at. It provided a lot of the good footage on the nightly news of moving vehicles. It's still in use. There were several police and military guys with guns enforcing a perimeter. I wanted to take their pictures as well, but decided against it. They were looking tough. Stearman aerobatic bi-plane with a wing walker. The Thunderbirds out on the ramp. I was wildly excited to learn that they have a woman flying this year. Her name is Caroline Jensen. She's a Major and an AF Academy Grad with 2,500 total hours in Air force aircraft, with 200 hours of combat time in the F16. It's about time. This is the Super Guppy. It's the only one left in service. The fuselage was built from scratch. The wings and tail are from a Boeing C97, which is the freighter version of a Stratocruiser; which I would like to point out is a 1950's airplane. It's used by NASA to ferry parts for the international space station. Notice how shiny she is. They've been out there with cheese cloth and wax. The door opens! How cool is that? The F22 Raptor. This recently went out of production. There have been problems with the on board oxygen generator which is being used instead of bottled oxygen. One pilot lost his life as a result of lack of oxygen, and several others have had incidents. Apparently in Alaska they have to fly in survival suits, with big gloves, and the pilots have had a difficult time reaching down to pull the emergency oxygen handle, which is between the seat and the cockpit side wall, the Air force has ordered new larger handles for all airplanes in the fleet. One wonders how the pilots feel about being in this plane. A Royal Air Force Tornado. They're in Tucson to train in the desert. Our weather is much better than in the UK. The Heritage Flight. That's a A10 Warthog on top, and a P51 Mustang on the bottom. If I had known that the Red Bull Airforce was going to be so cool, I would have brought the long lens! If they fly anywhere near you, go! This is their aerobatic helicopter. Yes, helicopter. I did not manipulate these images, he really did roll it. He rolled it side to side and he looped it. Just absolutely amazing to see. This is Kirby Chambliss, also on the Red Bull team. He's flying an Edge 540. This guy is just magic. Look closely at the photo. 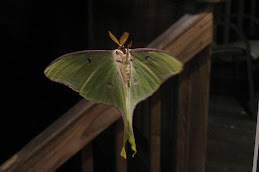 He's not flying away from the camera. He's flying sideways. It was the most amazing thing I have seen to date. Between the helicopter and this guy, they really made the show for me. As always, I look at all these planes (and those in the bone yard) and think about all the money that has been spent on armament. If all that money and brain power could have been redirected over the years, we could have warp drive. We could be off-world by now.